In my previous blog post, I outlined a couple of entry strategies for me to get in a long position on this pair. I had been keeping my fingers crossed for an interest rate hike, if not this month then most likely in their next announcement, but it looks like BOC hawks are running the show from here. The Canadian central bank decided to increase their benchmark rate from 0.50% to 0.75% and even hint of future hikes instead of delivering what many thought would be a “dovish hike.” Their official statement noted that the economy has completed its shift away from being dependent on the energy sector and that the factors weighing on price levels are temporary. In hindsight, I probably should’ve set my pullback entry higher and closer to the 87.00 area of interest, but I was worried about additional volatility leading to big spikes right around the time of the presser. That, or I should’ve tried to hop in at market when the hike was announced. Anyway, I still managed to get in a long position when my buy stop above the 89.00 mark was triggered. This is above the long-term inverse head and shoulders neckline I’ve been watching for a while now, and it does look like a convincing breakout that can be sustained. The reversal pattern is more than a thousand pips tall so the resulting uptrend could be of the same size. But, as I’ve mentioned in my Q2 2017 blog performance review, I’ll be adopting a short-term view on risk management as I try to lock in profits along the way. I’ve got my initial target at the next area of interest around 91.25 but I’ll be open to the idea of adjusting it higher and trailing my stop or closing partially. 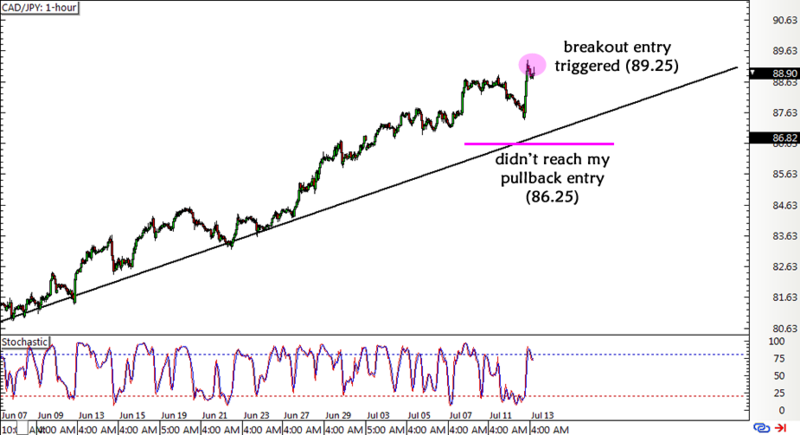 Long CAD/JPY at 89.25, stop loss at 87.25, initial profit target at 91.25. Asian session and London session traders could still price in their reaction to the more-hawkish-than-expected BOC statement for the rest of the day, but I think the focus will shift to the next policy decision from the BOJ next week. So far, it looks like traders are anticipating a dovish statement as reports from Japan have been mostly weaker than expected. I doubt that the BOJ will say anything to stem the yen’s decline either, so the Japanese currency could be looking at more downside in the coming days. What do you think?